Assistant Professor Rodrigo Mardonesg is a member of the Adult Reconstructive Surgery Group, Department of Orthopedics Surgery, at Clinica Las Condes and an Chief of the Hip surgery unit at the Hospital Militar,Santiago, Chile. 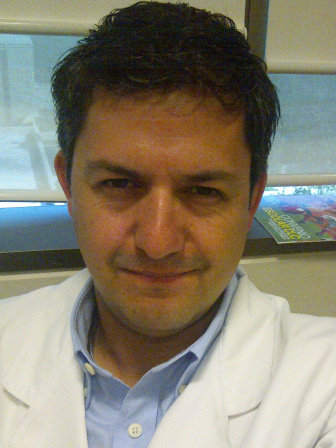 He is also a director of the Stem Cells for cartilage repair project at Clinica Las Condes. He received his MD at the Universidad de Chile in 1999 and completed a specialization in orthopedics in 2002. In 2002-2003 he did a research fellowship at the cartilage connective tissue repair laboratory at the Mayo Clinic under the direction of Shawn Odriscoll and Gregory Reinholz followed by a Clincal Fellowship (2003-2004) on Adult Reconstructive Surgery at the Orthopedic Department Mayo Clinic Rochester minnesota. He became Assistan Professor of orthopedics at Pontificia Universidad Catolica in 2005. He is actually Profesor Agregado of Orthopedic at Universidad de Chile in Clinca Las Condes . Rodrigo Mardones research has been focused on cartilage repair and with main focus on cartilage regeneration with the use of stem cells from bone marrow and adipose tissue. His clinical practice is also focussed on cartilage repair and preserving hip surgery. He had clinical and basic research work on hip artrhoscopy. He is actually a Associate master Instructor at the AANA master course on hip scope. Rodrigo Mardones has been on the general board of ICRS since 2006.